When it comes to craft projects, I rarely make the same thing twice, but my newly-completed Scatterbrain Quilt No.2 marks my first quilt repeat! Well...kinda. My first Scatterbrain quilt, was a crazy quilt-as-you-go adventure with no regard for color, pattern, or sanity which made this "repeat" project feel far from repetitive. I mentally call these two quilts my "Bob Ross quilts" because of my approach to them. "We don't have mistakes, just happy accidents!" I even watched a good deal of Bob Ross' "Joy of Painting" while I worked on the quilt. His show makes for great, relaxing background noise. Scatterbrain Quilt No.2 was made as a commission for my friend and coworker (as well as super talented fabric designer) Patty Sloniger. She provided me with a bin of adorable fabric scraps to work with made diving into this project extra exciting. Being a relatively new quilter, I'm eager to see new fabrics (new to me anyway) in person. 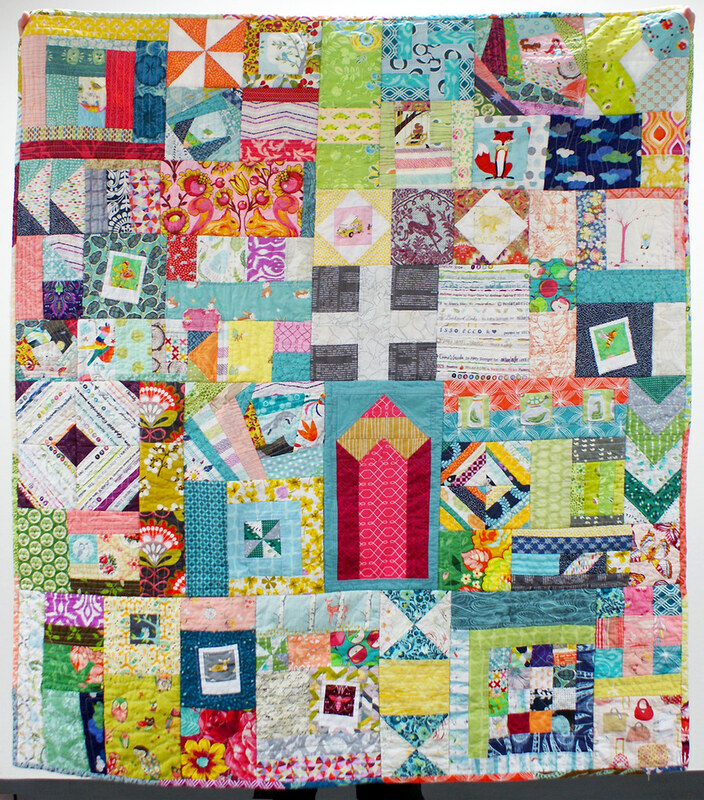 One of my favorite parts of this quilt (as well as Patty's) is the big pink pencil near the center! I often doodle ideas for quilt blocks when I have a minute of free time, and this pencil was one of the results. I love how easy it was to piece, and I think the payoff far exceeds the effort it takes. In fact, I also just completed a mini-quilt for the May Houston Modern Quilt Guild swap using these pencil blocks. I plan to blog about it later this week, so check back! In the end, I was both sad to hand this baby over yet happy that my work could bring a smile to someone else's face. Fabric: Too many to mention, but lots of Patty Sloniger's own designs! Pattern: Whatever I felt like! This was the first time I made my pencil block though.